Unless you know how to code, WordPress doesn’t actually offer any way to add buttons in your posts or pages by default. But don’t worry – all is not lost. There are plugins that let you add buttons in WordPress without needing to know any code. And in this post, I’m going to give you guides on how to use two of those plugins. You’ll be creating beautiful WordPress buttons in no time! What’s the deal with WordPress buttons, anyway? Most of the time, if you need a button with specific functionality, it will already come bundled with whatever plugin offers the functionality you need. For example, if you use a contact form plugin, it will automatically create a Send button to go along with your form. And while these buttons help with specific situations, they don’t cover the scenario in which you need to add buttons in WordPress posts or pages. Which is unfortunate…because including buttons in your posts and pages is actually pretty beneficial for your site. See, buttons grab your reader’s attention. So if you want to emphasize a certain link in your post, a button is a great option. Isn’t that more attention-grabbing than a regular ‘ole link to SiteGround? Best of all, you can use buttons to link to external websites or send readers to important areas of your own site. The plugins I’m about to show you will let you link your buttons to any URL you want. How can you add buttons in WordPress? Because the third one isn’t very beginner friendly, I’ll skip it for now. It has too many acronyms anyway! To handle the first two methods, you can use plugins. Below, I’ll recommend a two of the most popular options and give you a quick tutorial on how they help you add buttons in WordPress. MaxButtons lets you add buttons in WordPress using shortcodes. The button creation process can be a little time consuming because it’s a separate interface, but it enables you to create some truly beautiful and unique buttons. 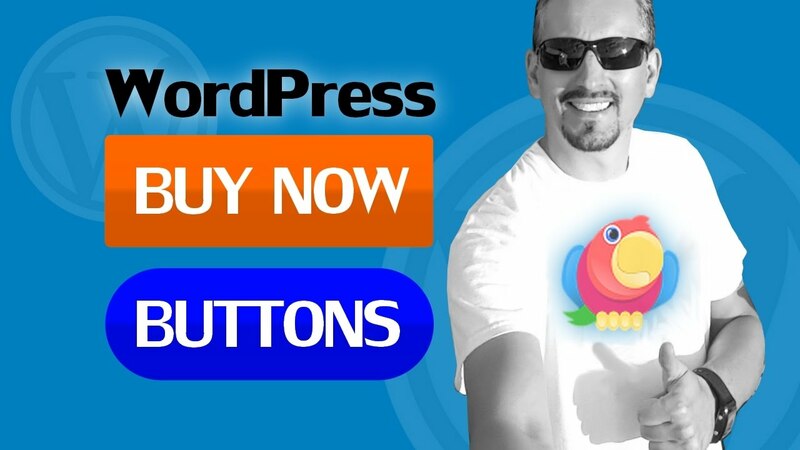 To create WordPress buttons with MaxButtons, you just need to download and install the plugin. Then, you can create a button by clicking on the MaxButtons link in your dashboard sidebar. Unfortunately, you can’t add buttons directly in the WordPress Editor, though the plugin does make it easy to insert buttons you’ve already created. You’ll see a ton of options. But the most important settings are in the first box. Many of the other options are just there in case you want extra control over how your button looks. Button Name – your visitors will never see this – it’s just to help you remember. URL – this is the link people will go to when they click on your button. You can also change fonts and font colors if you’d like. Once you’re happy with your button, click the Save button at the top of the page. You won’t see your button in the WordPress Editor. But when you publish your post, your button will be there! Because MaxButtons relies on shortcodes, if you ever deactivate the MaxButtons plugin, all of your buttons will disappear. Forget About Shortcode Buttons is another simple option to add buttons in WordPress. But, as you might be able to glean from the name, it doesn’t use any shortcodes. That means you can deactivate the plugin at a later date and all of your buttons will stay intact. Once you’ve installed and activated Forget About Shortcode Buttons, you can create buttons right in the WordPress Editor. And when you’re ready to insert your button, just click Insert. Button Builder – Buttons X – a nice option because it comes with pre-designed button packs. Mango Buttons – has some very pretty default button styles. And if you want to get really creative, you can read about how to use HTML and CSS to create WordPress buttons. But for now, you’re totally fine to use these plugins to add buttons in WordPress posts! If you need anything explained more in-depth, feel free to ask away in the comments below.